For over 30 years, former corporate trainer Lynn Kampfer lived what most people would consider the American Dream. Married to her childhood sweetheart and raising two kids, Lynn and her family enjoyed the best that life had to offer. Yet, as Lynn began to search for God the outer edges of her lovely life began to crack and crumble. In this episode of the Better Together podcast, Lynn shares not only her dramatic story but more importantly, incredible lessons learned about God’s faithfulness, provision, forgiveness and hope. Lynn will definitely inspire you as she shares about surviving breath-taking heartache and how to thrive even as life takes an unwelcome left turn. As you listen to today’s podcast, I want you to draw hope and encouragement from Lynn’s story – especially if you feel like your life is falling apart. How God never abandons us when the unthinkable in life actually happens. Forgiveness is a difficult and often misunderstood concept. There's not enough space in this post to properly cover the topic, but I hope that you listen to Lynn's podcast because you can learn a lot from her journey to forgiveness. It wasn't easy, but she is so wise in how she journeyed through it. POST A COMMENT ON THE BLOG: Can you tell us about your forgiveness journey? What was hard? How did God help you? If you're still struggling, how can we pray for you? Click here to listen to other episodes of the Better Together podcast. Barb Roose is the host of the Better Together podcast. She's a women's conference speaker with a passion to teach women how to win at life with strength and dignity. Barb is the author of multiple books and Bible studies, including her new book, Winning the Worry Battle (2018) and Bible study, Joshua: Winning the Worry Battle (2018). Are you tired of cleaning up the same messes day after day? Are you tired of making dinner, changing diapers or driving carpool day after day? If you answered “yes” to any of those questions, you aren’t alone! In fact, you’re invited into a guilt-free zone for a precious conversation today about embracing God’s grace in the messiness of motherhood. On this episode of the Better Together podcast, my guest is speaker and author, Amy Seiffert. She’s the author of the new book, Chin Up: Wearing Grace, Strength and Dignity When Motherhood Unravels Our Soul. Amy and her husband, Rob live in NW Ohio and they are the parents of three kids. For the past 16 years, Amy has been writing and speaking on staff with Cru and she's the Director of Outward Movement at Brookside Church in Bowling Green, OH. Before she became a mom, Amy pictured motherhood as a beautiful dress that she saw her friends wearing so beautifully. However, Amy felt that her motherhood dress felt floppy and didn’t fit quite right. 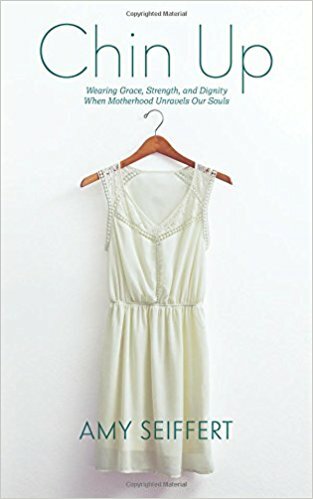 She says that every time she tried to adjust or change, her motherhood dress would shift and expose the things that she wanted to keep covered up. Amy and I talk about how she found God’s grace in the mundane and maddening tasks of motherhood. If you’ve ever struggled with endless laundry, Mom, I’m hungry, hated playing Barbies or was tempted to burn your kids’ puzzles, Amy’s been there. One of the most powerful parts of our conversation centered around changing our perspective on the endless loads of laundry or those long sleepless nights. I love how Amy’s former seminar professor calls those seemingly mundane tasks “maintaining and sustaining.” In her book, Amy writes that when we see the sunrise and sunset or the seasons change, those are examples of how God maintains and sustains our world. Amy was encouraged when she realized that her maintaining and sustaining tasks like laundry, making dinner and changing diapers mirrored God’s work in our world. I hope that you listen in for that powerful conversation. Sweet friend, if you’ve been beating yourself up for not being the kind of mom that you want to be or feeling guilty about not always enjoying motherhood, Amy’s story is perfect encouragement for you. Barb Roose is the host of the Better Together podcast. Barb is passionate about reaching women and teaching them to win at life with God-empowered strength and dignity. She loves speaking at women's conferences and events on the topics of fear and worry, self-care and leadership. Barb is the author of multiple books and Bible studies, including April 2018 releases, Winning the Worry Battle (book) and Joshua: Winning the Worry Battle (Bible study). Check out Barbroose.com for more information.